BroadLink® RF-IR Blaster Automation Hub: Need an easy phone app system? Take a look at our affordable blind and shade hub, operated by Android and IOS apps. This RF-IR blaster WiFi hub can "learn" RF radio signals for our blind motors and skylight/window openers, and many other devices. It has the ability to learn IR commands for all your media systems, and it also has IFTTT event triggering (if-this-then-that). 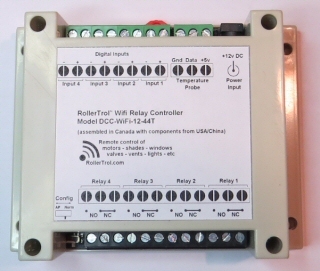 Using WiFi for relay control of devices is an economical way to control relay outputs for motors, valves, lights, etc. In the previous article, we looked at how to use the Android app to assign an available IP address to communicate with the relay module. 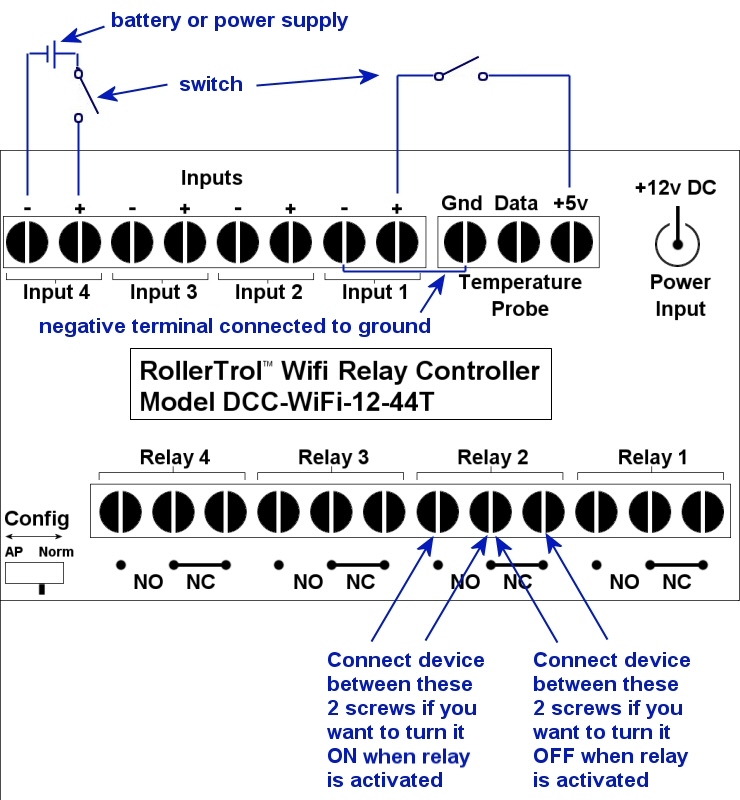 In this article we'll see how to connect your circuit devices to your wifi relay module. You should be sure to install the app and set the network IP address before you start setting up the connections, so that it is easy to test. The relays each have normally open (NO) and normally closed (NC) terminal options; see the comments in the picture below. Please note that these are completely isolated relays, so you need to provide power in the circuit; the relays do not feed any power to the circuit. The advantage of this is that they can be used to control any type of voltage, AC or DC, up to the rated capability. Please Note: We do not recommend that these be used to control grid power levels, they are designed for low voltage use only. The inputs can be used in a variety of ways, in the diagram below we show two typical ways to use them, and one of them borrows power from the 5 volt output to complete a circuit (see input 1). The 4 inputs are high impedance and use very little current. They will show as ON when any voltage between 4 and 27v DC is present at the screw terminals. The switches can be any type - magnetic window switches, microswitches, toggle, etc. There are 3 terminals for the DS18B20 waterproof temperature sensor﻿. You can simply attach it, and it will work immediately (red to +5 power, white to Data, black to GND).